We shared several discussions on the benefits of migrating to Cisco ISR 4000 Series, such as The “Always On” Cisco ISR 4000, The New ISR 4221, the New Cisco DNA-Ready Platform, ISR 4321 vs. 4331 vs. 4351 vs. 4431 vs. 4451 Router, and Something about Cisco 4400 and 4300 Series. Cisco has got a big evolution of Cisco routers. In this article we will share some tips for upgrading your Cisco routers. Cisco ASR 1000 Series Routers were developed as a direct replacement for Cisco 7200 Series Routers. Cisco ASR 1000 Series Routes are feature-rich edge routers that address the complex requirements of the modern networks. These routers meet the needs of both service providers and enterprises. They are available in sizes ranging from 1 rack unit (RU) to 13 RU. The feature set is common across the 1 RU to 13 RU size range. The only difference is performance and level of hardware redundancy that may be needed. In most cases, the 2 RU sized Cisco ASR 1002-X will be the appropriate replacement. It offers switchable performance from 2.5 Gbps up to 36 Gbps with no hardware upgrade. Note that the performance is sustained even when multiple built-in features such as secured VPN technology and a zone-based firewall are switched on. Cisco ASR 1000 Series Routers were developed to sustain multiple features beyond traditional routing protocols and packet forwarding. Cisco ASR 1006 will be most suitable for networks that need a high level of redundancy. For networks that have grown dramatically or need a very large amount of network interfaces (for either Layer 3 or Layer 2), the 13 RU sized Cisco ASR 1013 may be considered. For branch use, Cisco ASR 1001 or Cisco ASR 1002-X will be most appropriate. 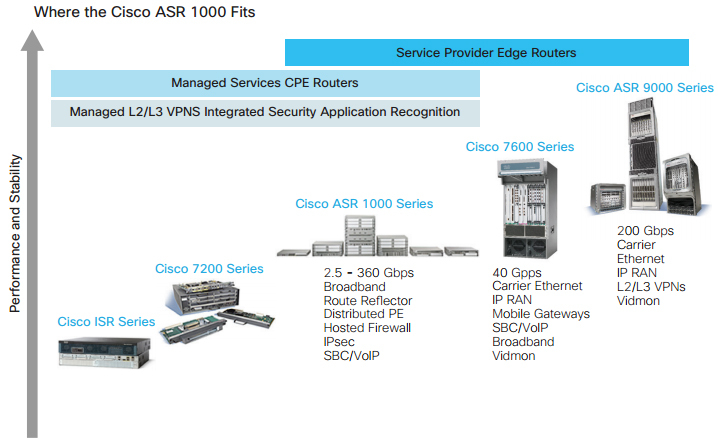 For WAN aggregation and Internet Edge use with full internal hardware resiliency, Cisco ASR 1006 should be considered. Cisco ASR 1002-X is also a suitable platform, and it offers inter-chassis resiliency capability. The entire Cisco ASR 1000 Series Routers have a fully separated data plane that is hardened against DoS attacks. Cisco ISR 4451-X—For deployments that need throughput up to a ceiling of 2 Gbps, the new Cisco ISR 4451-X is a cost-effective option. It again offers switchable performance (no hardware upgrade needed) of 1 Gbps or 2 Gbps. The Cisco ISR 4451-X offers a broadly near-identical set of features as the Cisco ASR 1000 Series Routers. The Cisco ISR 4451-X runs the same operating system and software release numbering is identical to Cisco ASR 1000 Series Routers. The Cisco ISR 4451-X can also accept Cisco Unified Computing System (UCS-E) cards for offloading certain features or for running customer-specific software inside virtual machines on a high performance multi-core Intel chipset. Cisco’s full WAN Optimization solution can run on these cards, offering built-in Citrix acceleration as part of its capabilities. The Cisco ISR 4451-X can be a suitable replacement for Branch, WAN aggregation, or Internet edge locations. Cisco ISR G2 3945E—The Cisco ISR G2 Series Routers offer feature richness, unified communications including Digital Signal Processor (DSP) capabilities for voice and video and security functions such as IPS, Firewall, and web security, and content filtering. Cisco UCS-E cards enable additional features such as rich WAN optimization capabilities. The Cisco 3945E is ideal for branch deployments where the high performing Cisco ISR 4451-X or Cisco ASR 1000 Series Routers are not needed. Which Platform is most Suitable? Once you have determined that the features you require are supported, in general any router within a series will be suitable. With the Cisco ASR 1000 Series Routers, the differences between the platforms relate to performance and level of redundancy. The larger platforms are capable of higher throughput. A typical choice is the Cisco ASR 1002-X platform which can be purchased to support 2.5 Gbps of performance (with features) but can be turned up to 36 Gbps with no hardware swap-out needed. For highly resilient WAN aggregation and Internet Edge scenarios the Cisco ASR 1006 platform is more suitable because it can continue to operate with hardware failures within the chassis. The smaller Cisco ASR 1000 series platforms offer software-based resiliency with multiple redundant IOS processes running on the Linux kernel in IOS XE, and hardware based redundancy using protocols such as Hot Standby Router Protocol (HSRP) operating between devices. For lower throughput scenarios or for scenarios that require in-box WAN acceleration, the Cisco ISR 4451-X is the most suitable platform. If an unusual feature is needed that is not supported on the Cisco ASR 1000 or Cisco ISR4451-X platforms, then the Cisco ISR G2 3945E should be considered. Q: What if further assistance is needed? A: The Cisco 7200 Series Routers have been successfully migrated to more modern Cisco routers in thousands of customer networks over the past two years. So, we are confident that all common Cisco 7200 scenarios have been addressed or enhanced. If it is possible for Cisco to obtain a copy of your router configuration file then it can be submitted to your Account Team. The router configuration file will be checked for any CLI that has been deprecated, and workarounds suggested. Q: Is there a list of every single feature that is not supported on replacement hardware? A: There are hundreds of thousands of command line combinations in IOS, of which we believe very few are not supported today. They are the ones which are either removed because the scenarios have become outdated, or ones that are uncommon and not likely to be required by any customer, or are planned for a later release.